One of the most acclaimed contemporary artists in Singapore, Ho Tzu Nyen freely and airily moves from one medium to another. His series of works that features tigers as the main motif, including The Song of the Brokenhearted Tigers (2012), Ten Thousand Tigers (2014), 2 or 3 Tigers (2015) and Timelines (2017), demonstrates the width and depth of his artistic vision and approaches. We interviewed Ho at Performing Arts Meeting in Yokohama (TPAM) 2018 where his latest work on tigers, One or Several Tigers was shown. Ho Tzu Nyen is a Singapore-born filmmaker and visual artist whose practice spans video, writing and theatre. His work explores the structure and power of myths, often revealing stories as discursive probes to shape past and present. 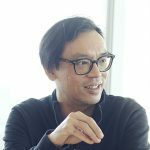 His theatrical works have been presented at the Asian Arts Theatre, Gwangju, Wiener Festwochen, Theater der Welt and the Kunstenfestivaldesarts, and his films were shown at Cannes Film Festival and Venice International Film Festival. Recent solo exhibitions were held at Guggenheim Museum Bilbao, Mori Art Museum and Ming Contemporary Art Museum (McaM). ASIA HUNDREDS is a series of interviews and conference presentations by professionals whom the Japan Foundation Asia Center works with through its many cultural projects. 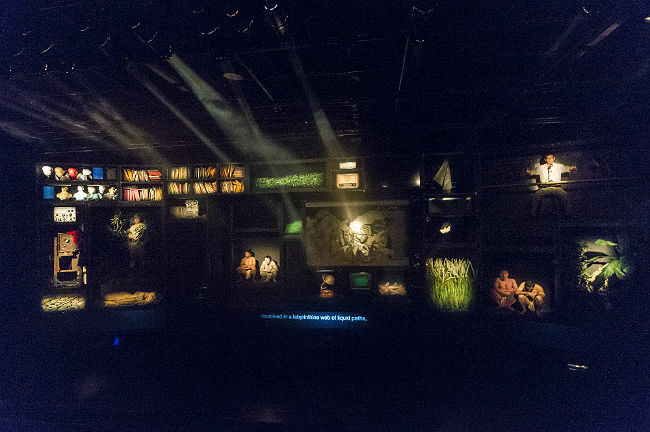 Ken Takiguchi (hereafter Takiguchi): You have been working on a series of works that features tigers as the main motif including One or Several Tigers, which is now shown at Performing Arts Meeting in Yokohama (TPAM) 2018, and Ten Thousand Tigers (2014) in which I participated as one of the translators of the script. Let me begin this interview by asking this – Why tigers? What in this creature attracts you the most? Ho Tzu Nyen (hereafter Ho): There are two immediate responses to that question: The first is that Singapore used to be full of tigers. 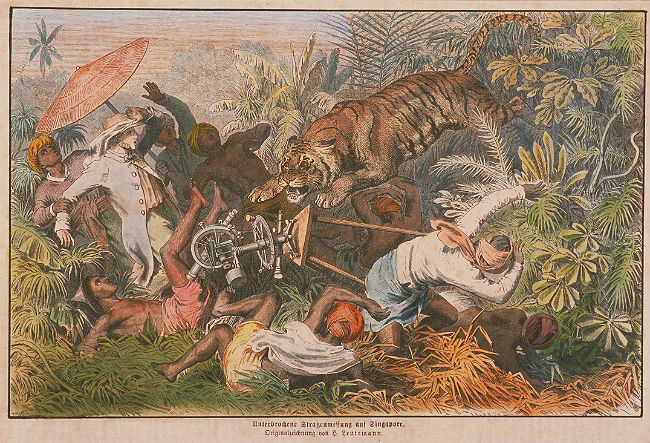 After British colonization, however, tigers were actually one of the main victims and they became extinct. 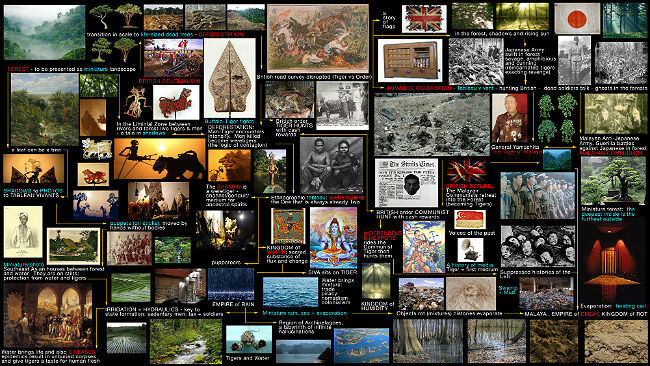 Tigers thus became for me a starting point for rethinking about our history of colonization, from a perspective that is not solely restricted to the human one. The second reason is a symbolic one – Singapore literally means "Lion City". The name came from the myth that Sang Nila Utama, a Srivijaya prince from Palembang, arrived sometime between the 12th and14th Century, and saw a lion upon our shores. But lions were not native to Singapore. What our region had were many tigers. So using the tiger as a motif for thinking history is an attempt to dream of another history from the official history of the Lion City that has been sanctioned by the state. Takiguchi: There are two important images repeatedly referred to in this series: Heinrich Leutemann's wood engraving Road Surveying Interrupted in Singapore and Walter William Skeat's photo of weretigers on Pagan Races of the Malay Peninsula. What are the inspirations you got from these images? Ho: At the very initial stage of the project, I gathered a lot of images as a part of my research. Then I pieced together my narrative by composing a sequence out of these images, and these two images you mentioned were the key components of this sequence. Let me talk about Skeat's photograph first. 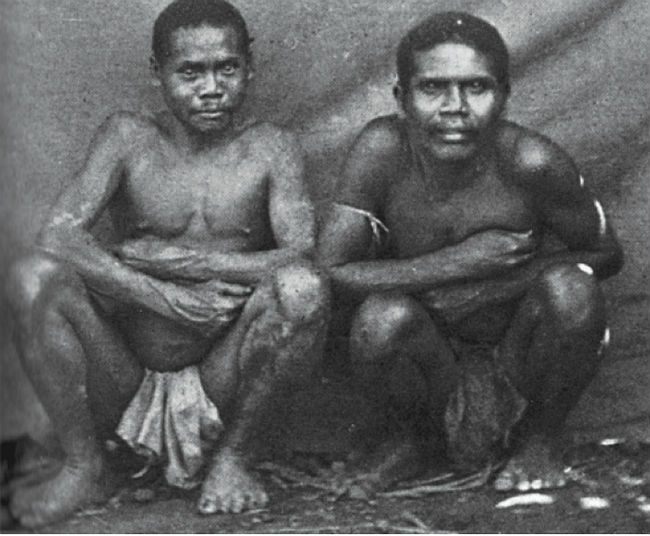 This image, in which two natives are squatting against an artificial background with very little depth, fascinated me in several ways. Photograph of Rumoured Weretiger from Walter William Skeat's Pagan Races of the Malay Peninsula,1906. Ho: First, what drew me to the image is the unease captured in it. The bodies of the two natives are very tense. They seem to be facing the camera with suspicion and discomfort. After all, this is an encounter between the colonizers and the colonized, between the anthropologist and the objects of his study. For me, this unease expressed solely through the mute body and the pose of the natives, seems to suggest an entire complex of power relations. Next, I was compelled by the paradoxical plurality it evoked. The two figures already generate a duality in the image, but the weretiger – a tiger that can transform into a man – is in itself double. So what drew me to it is this 'uncountability'. We can never be sure how many beings we are looking at, which also explains the title of the installation, One or Several Tigers. I've been researching on the relationship between men and tigers in the Malayan world since 2007. Tigers came to the Malayan world more than a million years ago, long before Homo sapiens even emerged. And when the first humans dispersed across Southeast Asia, they chose to live in the liminal zone between the forest and the waters, which was the favored habitat of tigers. And this proximity between men and tigers gave rise to a relationship between tigers and humans that was both symbiotic and symbolic. Tigers in the Malay cosmology are seen as vehicles, or mediums for ancestral spirits. And they can protect you but also punish you if you break a taboo. So the relationship is at best, an ambiguous one. But with the coming of the British, this relationship was ruptured. Nature is separated from human culture, becoming something that humans want to dominate, control or destroy. Now let me talk about the other image – Road Surveying Interrupted in Singapore. This print was produced around 1865, but it was based on an actual event that happened in 1835. A road survey was conducted by George Drumgoole Coleman, who was the Superintendent of Public Works in Singapore. Coleman was also the chief architect and first urban planner in Singapore. Many of the foundations of his buildings still exist in the center of Singapore. The National Gallery of Singapore, which currently houses the print, has an entrance facing Coleman Street, which is named after him. Ho: During the survey mission, Coleman and his entourage encountered a tiger. This tiger, instead of attacking humans, destroyed the instrument for triangulation called the theodolite. We can find so many possible narratives in this – the tiger as a force of wild, indigenous nature, and the British survey mission as the colonial dream of imposing order in space. Coleman's survey mission was carried out at a time when there was a worldwide demand for gambier and pepper, so this image also evoked for me the plugging of Singapore into the capitalist economy. More specifically, this image depicts the moment the tiger is leaping out at Coleman and his entourage. They, along with the theodolite, are all in the midst of falling backwards. Everything is suspended in mid-air. And this suspension is like a freeze frame in a movie. In that moment of suspension, all of these forces in play can be seen very clearly. It is precisely that moment when many different possible narratives can be unfolded. Takiguchi: The tiger in Road Surveying Interrupted in Singapore is an animal, thus the confrontation between nature and artificial things is obvious. However, the weretigers in Skeat's photo is a kind of in-between thing. When we start talking about them, the dichotomy is lost, and we start to think about marginal things. In your concept, what is the moment the animal tiger transforms into the weretigers? Ho: Exactly. The tiger projects are indeed an attempt to subvert and complicate these types of binaries. At first glance, this clash of opposites jumps out at us from the image – the tiger leaps in from the right, Coleman falls to the left. However, in the pre-Islamic Malayan cosmology, tigers and humans are not separated that clearly. People refer to the tiger not by its proper name but by kinship terms – uncle, grandfather or datuk. Tigers are seen as related to the ancestral, and shamans in many parts of Southeast Asia were believed to have the ability, or the curse, to transform into weretigers. The separation between nature and culture, which is a dominant paradigm for Western epistemology of that era, is not inherent in the Malay world. What is also very interesting to me is that after the annihilation of tigers as a result of colonization, they keep returning to haunt the Malayan world as metaphors. Etymologically, the word "metaphor" originates from a Greek word that means "transfer", but also to "carry over" and to change and alter. And the tiger in the Malay world was exactly a kind of transference device for ancestral spirits as I mentioned above, but also for all other kinds of beings that are neither entirely inside nor outside of the human sphere. For example, a shaman lives at the edge of civilization because he passes between the sacred and secular world. He is a figure that wanders between two worlds. Likewise, outlaws, invading armies or the communist guerillas – those who I talked about in Ten Thousand Tigers and One and Several Tigers – moved between civilization and the outside world. This is why these groups were often described in popular literature as being 'tigers' long after tigers were wiped out in Singapore. The story of tigers in Singapore continues after their physical extermination, and my tiger projects are an attempt to track the forms of their eternal returns, as a kind of haunting of Singapore. Takiguchi: These metaphorical tigers are marginalized figures and are put against the mainstream narratives of history. For example, you talked about Lai Teck, who is considered the greatest traitor to the Malayan Communist Party*1 in Ten Thousand Tigers. Are you trying to develop an alternative history in this series? *1 Founded in 1930 and having laid down its arms in 1989, Malayan Communist Party (MCP) was a major anti-Japanese organization that organized sabotage and ambushes against the Imperial Japanese Army during World War II. It was declared illegal by the British rulers after the War, which caused the Malayan Emergency between 1948 and 1960. Lai Teck led MCP as the Secretary-General from 1939 till 1947. He is believed to have been a triple agent serving the French, British and Japanese. He fled to Thailand in 1947. Ho: The marginal is not the binary other. It is much more interesting to think of it as being both on the inside and the outside, both one and the other. For me, the true nature of the tiger is ambiguity – it can be both human and tiger. A shaman is outside of the 'normal', but he is at the same time integral to the structural functioning of a society. This is why I associate Lai Teck as part of this larger myth of the weretiger. In Lai Teck, you do not have a person that you can position in a very certain way. He is a figure that moves between worlds. The tiger projects are definitely an engagement with official history. But I am also very wary of constructing another version of history that positions itself as 'alternative', which seems to me to be the replacement of one essentialistic narrative by another. What I am interested in is a fluidity that disrupts this kind of stability, while keeping the possibility of transformation and change alive and open. Takiguchi: The narrative of Ten Thousand Tigers is actually very mythical. Was it your intention to use the myth as a framework to represent the ambiguity? Ho: Yes. In today's world, we tend to think of myth and history as a binary opposites – we keep talking about a series of binary opposites in this interview, don't we? Men and tiger, rationality and magic, and the secular and sacred. We often think that to be modern – or to be rational – requires the elimination of myths in our society. And I think that it is one of the biggest myths of our time that a modern and rational society has no myths. As the French philosopher Georges Bataille puts it very beautifully; the absence of myth is the very myth of Modernity. Takiguchi: The set of Ten Thousand Tigers was basically a large shelf. It was a metaphorical repository where the memories and histories were stored. Also, it was a space where these things were exhibited so that we had access or exposure to that kind of information. I assume the repository metaphor is important for you to develop your artistic idea. Ho: Yes. As a practitioner, one of my starting points is collecting. I collect information. I collect discourses. I collect images. And my processes of thinking often involve the creation of some kinds of maps to coordinate, and to complicate the relationships between these elements. Rather than starting with a script, I always begin with diagrams. The set of Ten Thousand Tigers can be understood literally as a manifestation of such a diagram. Takiguchi: The house programme of Ten Thousand Tigers has an "atlas" inside. On the left side of a double-spread page, we find items related to nature and humans ― forest and deforestation, tiger, men and weretigers. The items related to the history of Malaya are on the right ― British colonialism, Japanese occupation and Malayan communists. This should be an example of the "mapping". Ho: Exactly. We can think of the Kunstkammer, or Cabinets of Curiosities as an example of this kinds of mappings although these are mappings that should be differentiated from the type of colonial survey and mapping missions carried out by Coleman. The Kunstkammer, which was one of the inspirations for the shelf-like set of Ten Thousand Tigers, unfold not by reason, but by resonances. Takiguchi: But you have to decide from where in the diagram – or the network of ideas – you start your story. Ho: When I was doing Ten Thousand Tigers, it frankly seemed like I could start and end at any point in the dragram or map. I don't really know if I have a clear answer for how I decided where to start eventually. I remember arranging the narrative according to a 'chronology', and then disposing of that to find another structure that is non-linear, jumping from different points in time in order to generate the maximum amount of associations, resonances and intensities. Takiguchi: You chose theatrical live performance as a mode of presentation for Ten Thousand Tigers, whereas video installation was chosen for One or Several Tigers. What is the reason for the different choices? Is it because of the different nature of the narratives you intended to make? Ho: My friend Max-Philip Aschenbrenner, who is one of the directors of the program at TPAM, once described me as an interface artist. I don't know exactly what he meant by that, but this may have something to do with your question. I am interested in transmitting these ideas from one medium to another, which has a certain kind of resonance with the tiger in the Malay world which was a vessel that contained another, and which could undergo constant transformation. But another reason why my projects migrate from discipline to discipline is the pragmatic desire to throw these ideas out to as many people as possible. I started my career as an artist in the field of visual arts with Utama, Every Name in History Is I in 2003. Back then, the audience from contemporary visual arts in Singapore was extremely small. So after the exhibition, I repackaged the entire project as a 'history' lecture that I could 'sell' to schools. These lectures were delivered in secondary schools and universities, which eventually got me involved in the performing arts. Let me go back to the question about the different formats for Ten Thousand Tigers and One or Several Tigers. At some level, the only differences between the two is whether 'live' humans are engaged or not. But I do think that both works are, in some sense, theatrical works. I believe that a fully automated work can be as theatrical as a theater piece. Conversely, a theater piece could actually be as non-theatrical as a painting. Ho: It is certainly true that each form has its own specific historical trajectory, and its own specific mode of interface with the audience, which I try my best to learn about. But when I am making a work, what concerns me is not whether it is theater or not, but the particular form of its theatricality. What interests me is not theater but theatricality. There is a particular way of thinking about theatricality in the visual arts as American art historian Michael Fried discussed in his great book, Absorption and Theatricality: Painting and Beholder in the Age of Diderot (1980). To put it very simplistically, Fried discusses the issue of theatricality, and its opposite – absorption – by drawing upon the arguments of French philosopher Denis Diderot, who was also a great art critic and a theater critic. To Diderot, a good theater piece is defined by a kind of anti-theatricality, a technique by which one can somehow bracket, or suspend the consciousness of being watched. Theatricality, then, can be described as the self-consciousness of being seen, and absorption as the technique of extinguishing of that awareness. I compose many of my works as a kind of rhythmic movement between these two modes. Generally, I find that my natural tendency is to push the theatrical when I work in the context of the visual arts, while when I work in a 'live' context, my starting intention at least, is to produce something as un-theatrical as possible. The set of Ten Thousand Tigers was essentially a large shelf as you mentioned, which negates any depth in the theater. Audience members basically looked at a large, flat surface, looking at the Kunstkammer part by part. Or perhaps it is a screen with multiple 'windows'. And I often find ways to negate, or at least to suspend human presence on stage. This is why my four actors were almost immobile in their little niches on the shelf, while the objects on the rest of the shelf were all automated. Ho: But when I work in the visual arts, I am quite drawn to pushing the work into a kind of excessive theatricality in an art world that favors the cool and conceptual. So I often accompany the projections with lights, intense sound and automated theatrical machines. My ideal for installations is that the audience can experience them as the unfolding of a 'live' event.